Jim Steele is a so-called environmentalist who rejects climate science and fails geography. Some environmentalist! He's another born again denier whose articles have started to appear more often on Anthony Watts' anti-science blog. Today on WUWT he has a go at the people of Kivalina. Many readers may be familiar with this settlement because they took on Exxon a few years ago. They didn't succeed in the courts. The people of Kivalina will need to relocate in the near future as their settlement will soon be uninhabitable. Kivalina is a tiny settlement situated on a barrier reef on the Chukchi Sea. It's at the mouth of the Kivalina River. Because the ice is melting sooner in spring and forming later in autumn, the settlement is more vulnerable to sea surges and storms than in the past, when ice lasted longer and protected it. It is reported that the barrier reef is rapidly eroding from these storm surges plus, presumably, rising sea levels. Two points. Firstly, it's not the winter ice that's the problem, it's the fact the ice is melting sooner and forming later than it used to. Secondly, Kivalina is on the Chukchi Sea, not the Bering. This chart from Cryosphere Today shows how the sea ice has been declining over the years. Note particularly the anomalies in recent years - from the late nineties in particular. What is the expected time line for a complete failure of the usable land? The winter storms of 2004 and 2005 eroded 70 to 80 feet of uplands behind the school. The bank line is now within 25 feet of the main school structure. Erosion in the vicinity of the AVEC tank farm is similar, with only 5 feet of uplands remaining between the nearest tanks and the bank line. Without the construction of emergency erosion control structures, the school and tank farm will begin to fail within the next year if erosion continues at the same rate as it has during recent months,. Even if erosion slows, these critical structures are in imminent danger and are unlikely to survive for any extended period of time. Due to the physical lack of open land in the Kivalina community, these structures can not be relocated, and their failure would render the community uninhabitable. You sometimes read fake outrage on WUWT, from deniers who try to argue that the world's poor need to burn fossil fuels or they'll get poorer. But when it comes to vulnerable people who's lives are being turned upside down by climate change, the deniers show their true colours. Most of the WUWT comments are lashing out at the BBC, because there was an article on the BBC about Kivalina. There was one comment by a person outraged that anyone would consider looking out for the interests of indigenous peoples. Heck, what decent plundering victor would give a toss for displaced persons. PS So far, not a single fake sceptic at WUWT has commented on the fact that Jim Steele was wrong and that Kivalina isn't on the Bering Sea! Nor that it's the fact the ice season is shorter that's causing problems, not mid-winter ice. However the Bering Sea extent is a good climate indicator and correlates well with sea ice in the Chukchi. Remember, Jim Steele is a man who thinks heat waves disprove global warming! So is it any surprise that he maintains such wildly different patterns are a good correlation? A major factor of Kivalina's rapid erosion is due to a bum construction job. We've known that the city was slowly washing into the water for years, and there have been plans in the works to move the city for ages now (that is one of the reasons the school is the oldest in the district; there will be no new construction because the move is inevitable). Although climate change is undoubtedly a factor, the sensationalism played up as "global warming" is primarily from man removing gravel from the sea-side coast. Looks to me as if the mistake was made way back at the turn of last century when, based on what I've read, the community was pretty well forced to relocate to where it is now. I would not be surprised to learn that there are multiple factors at play, there usually are - and that it's not simply global warming that's causing the problems. Nice attempt at character assassination . Try as you might I never said Kivalina was in the Bering Sea. However the Bering Sea extent is a good climate indicator and correlates well with sea ice in the Chukchi. 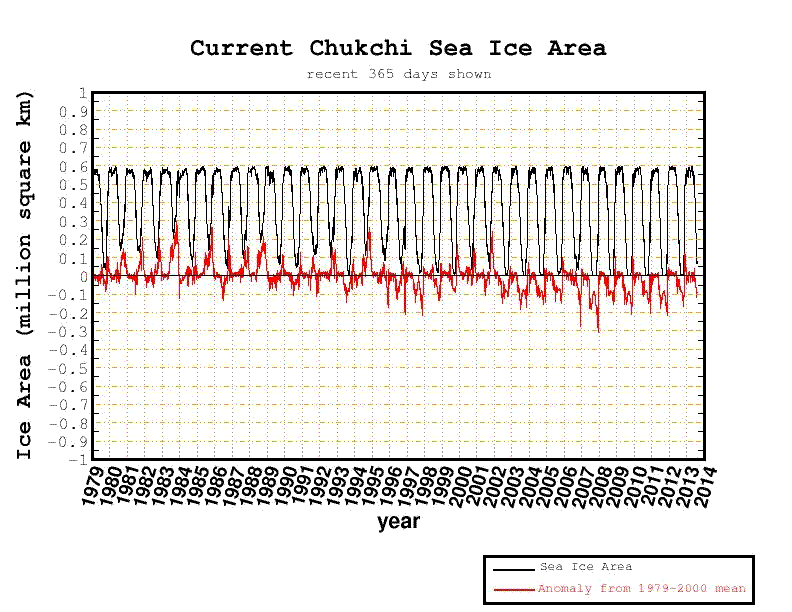 Look at the Cyrosphere graph for the Chukchi that you posted. Winter ice has been around or above average. Since 2007 when summer lows have lessened as the Chukchi sea ice has been recovering at the same time the Bering Sea ice has been expanding. You would think despite all the hype around blaming global warming, the fact that local temperatures are declining and sea level is dropping might be of more interest. Who is denying what? Chukchi and Barents Seas behave very differently from each other. 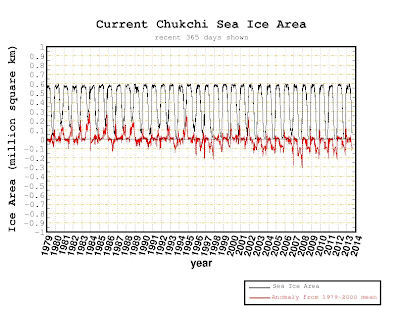 If you meant the Chukchi Sea then why didn't you write about the Chukchi Sea? Why did you spend so much time on the Barents Sea when there is plenty of data around for the Chukchi Sea - like the chart I posted above, which clearly shows the shortening of the winter season. Why did you focus on winter ice cover, when that's not the problem? It's the longer time without the protection of ice that's causing the problem. Winter ice is forming later and melting earlier, exposing the reef to more storms and surges. Sea level isn't dropping, it's rising. It takes some gall to deny that fact. It's pretty obvious "who is denying what"! Jim might like this post, too. Or try to deny it - who knows? Wow! By you wild distortions I must assume you got yourself into a blinding rage. As you posted, Barents Sea does indeed behave every differently than the Chukchi. Barents is affected by variations in intruding Atlantic water and the North Atlantic Oscillation while the Chukchi is affected by intruding warm Pacific water and the PAcific Decadal Oscillation. That said I never talked about the Barents Sea ice, so exactly what is so obvious to you? I talked about the Bering Sea ice and shared a NSIDC picture of how winter ice is growing in that region. Kivalina is on the southern end of the Chukchi that borders the Bering Sea, that's why it is relevant. At least you seem to agree with my post about Kivalina's real tragedy was the forced relocation to a bad location. If you are truly seeking the greater truth then I suggest you reflect your glaring mistakes in this thread. It is such unfounded and unsupported personal attacks that further polarizes people and defiles the process of respectful scientific debate. For now, I will seek more honest discussions elsewhere. The laws of physics will still apply elsewhere. The difference will be that here they are not denied. Global sea level continues to rise, as it must, since the global ocean is warming and warm water expands. Posting such deceptive or any articles on WUWT makes what you write fair game for HotWhopper. If you take the pointing out of your gross misdirections as "personal attacks" that's up to you. I guess you could argue it goes to character. You try to get around the fact you talk about winter sea ice in the Bering Sea (yeah, I meant Bering when I wrote Barents by mistake) because it's "close" to the Chukchi Sea. It's not a case of "near enough is good enough". The Chukchi is not the Bering full stop. Not only that, but you haven't explained why you wrote irrelevantly not just about the Bering Sea but at length about the Bering Sea in winter time, when that's not the issue either. It's spring and autumn that are when the risk is higher now. So you didn't just get the sea wrong, you got the seasons wrong too. Double misdirection in true science denying fashion. No science points for you. Now you draw attention to your monthly tide gauge chart at Nome Alaska - again on the Bering Sea. I didn't comment on that in my article, but now you bring it up. You are really fixated on pointing your readers to data on a completely different body of water, aren't you. One wonders what mathematics you did on that data that made you decide that the sea level is falling. And why you chose a monthly chart instead of the annual chart. (Leaving aside why you think the Bering Sea at Nome is a substitute for the Chukchi Sea at Kivalina.) Not only does a monthly chart hide the signal among the noise, but I can't figure how you decided that the sea level is dropping from such noisy data over such a short period of time. And that's leaving aside the issue of it *not* being the tide at Kivalina or the sea on which it is located. More misdirection in true science denying fashion. Here is the annual data for Nome. I can't see a clear signal eyeballing the annual data. The period is too short. Which raises the question, why you are so certain from the noisier monthly data? I notice in your main article you point to tide gauge data at Prudhoe Bay on the Beaufort Sea too. Are trying to argue that the sea level is dropping there as well? Is there a reason why you didn't mention your sea levels at Prudhoe Bay here on HotWhopper? Noisy monthly tides at Nome on the Barents and Prudhoe Bay on the Beaufort, not longer term sea level changes at Kivalina on the Chukchi. Thing is, the biggest issue from what I read is the storms occurring when the reef used to be protected by ice and now it isn't. You try through a series of misdirections to avoid that fact. I wonder what other subject matters you'll be trying your hand at in the future. It also appears you struggle with the correlation between the Bering Sea ice and the Chukchi As the Bering Sea ice grew, the negative anomalies in the Chukchi decreased, but may be the presentation of data as anomalies fooled you. Another valid way to express those same trends is that both Bering Sea ice and Chukchi sea ice have been increasing since 2007. Once you label someone a denier, it filters your sense of objective reality. Speaking of sea ice, Ice Cube has a line you may well heed "Check yourself before you wreck yourself"
Jim - time to give up the struggle. There is no correlation between Chukchi and Bering. Only in your dreams. Take another look. The behaviour is totally different. It's not just that Bering has had a positive anomaly recently (though that's part of it). The sea ice in the Bering fluctuates much more winter to winter as well as summer to summer. They aren't comparable at all. Always willing to reconsider, but you've not written anything to persuade me otherwise. On the contrary, you keep digging in deeper. Wrong Jim Steele. This one was a nature trail guide and bird watcher in the Sierra Nevada Mtns, and one heck of a manipulative liar.